Today Young Indiana and I went to Dublin’s “dead zoo”, aka the Natural History Museum. It’s pretty damn cool, although the two species of recently-extinct rhinos made me sad. 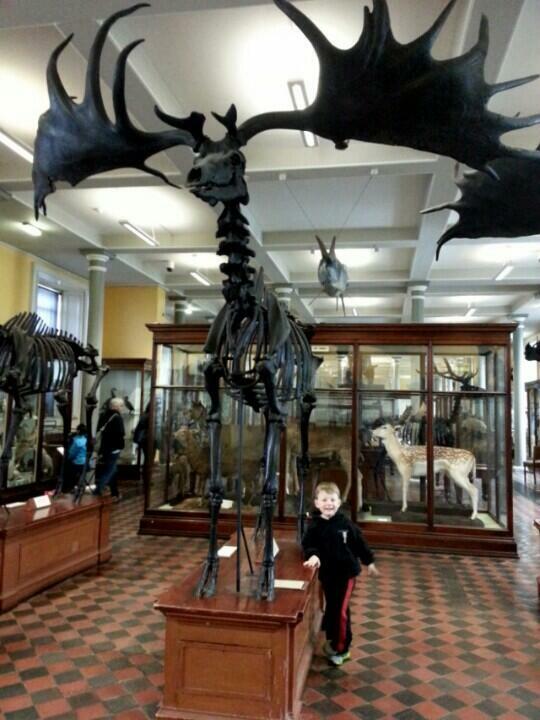 The giant Irish deer (aka Irish elk), however, did not make me sad. They just awe me. They’re about the same shoulder height as Alaskan moose, but they’ve got a more deer-like upright neck and thus come off as taller, so they’re just freaking HUGE. And the ANTLERS. The antlers are MENTAL. They are SO. BIG! I could stare at those things all day. SO. COOL. I am jealous of your Continuum viewage. We've still not got S3 in the UK yet. Argh! Want!